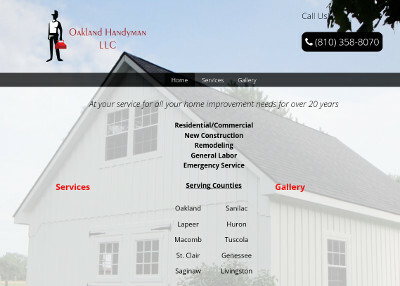 Corey, the owner of Oakland Handyman, LLC in Oakland County MI, asked us to assist with creating a basic website and a logo design for him. He waited until he had all of the information ready before placing his order. Once done, we had the website mostly done within 24 hours. He then sent us pictures to add to the Gallery page afterwords. For the logo, an initial design was submitted but he then opted to have it changed up and a different design was created. The website for Oakland Handyman, LLC is at oaklandhandyman.net.